Lawyers for Ashley Diamond say they are concerned about her safety while she's being held in a men's prison in Columbus, Georgia. Diamond alleges she was sexually assaulted again while in custody last month. 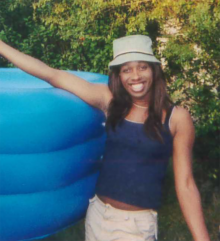 Lawyers for a transgender inmate say she still faces harm while being held in a men’s prison in Columbus, Georgia. In a report filed in court, lawyers for Ashley Diamond allege she was sexually assaulted while being temporarily held in Reidsville’s Georgia State Prison in a holding cell with another inmate last month. It’s the eighth time she’s been sexually assaulted while being incarcerated, according to her attorney. An independent investigation into the assault is currently underway, the report said. However, after Diamond filed a complaint about the sexual assault, her lawyers allege that the prison staff in Rutledge State Prison, where she is currently held, also violated her confidentiality by sharing with other inmates information about her assault complaint. Diamond alleges she was then labeled a “snitch” by other inmates, the report said, and faced verbal threats. “At present, we’re very concerned about Ms. Diamond’s placement within Rutledge State Prison given some of the events that have developed,” said Chinyere Ezie, an attorney with the Southern Poverty Law Center who’s been representing Diamond. The warden denies the allegations that information about her sexual assault complaint was shared, the report said. Diamond first filed a lawsuit against Georgia’s Department of Corrections in February claiming she was being denied hormone therapy treatment. The lawsuit prompted the department to change its policy to provide hormone treatment for transgender inmates.